My Jewish-centric trip to Morocco began and ended in Casablanca, a sprawling coastal mega-city that is choked with traffic and filled with endless buildings of peeling white paint. The city is home to 1,000 Jews and an incredible 20 active synagogues, plus a cemetery and museum of Jewish history. I quickly felt comfortable in the city when I walked into the apartment building lobby of my Airbnb. I noticed a huge mezuzah affixed to an apartment near the entrance. With impeccable timing, the apartment door opened and two women walked out, saw my friend and me pointing at the mezuzah and warmly greeted us. Immediate Moroccan hospitality. 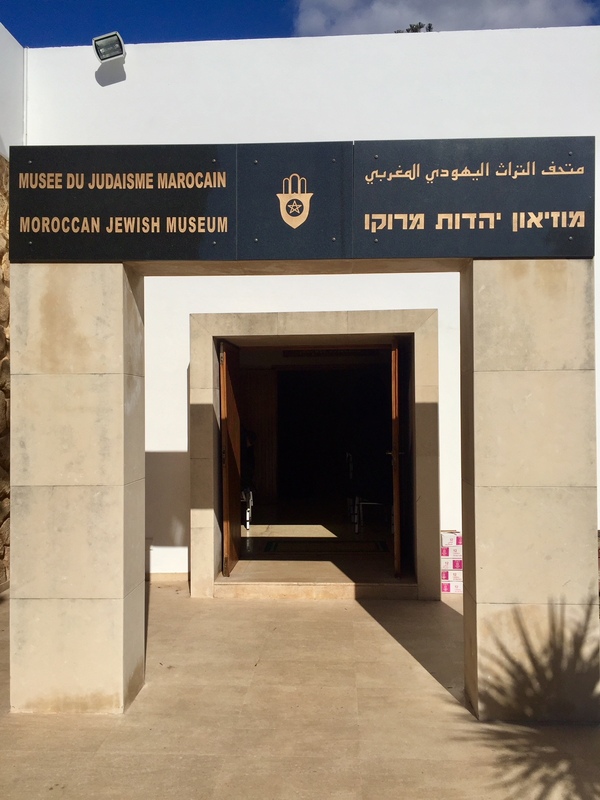 As in Fes, while wandering to find Jewish sites, locals in Casablanca were eager to help us identify these places, whose entrances were unmarked (technology was usually not too helpful. Locals were invaluable). 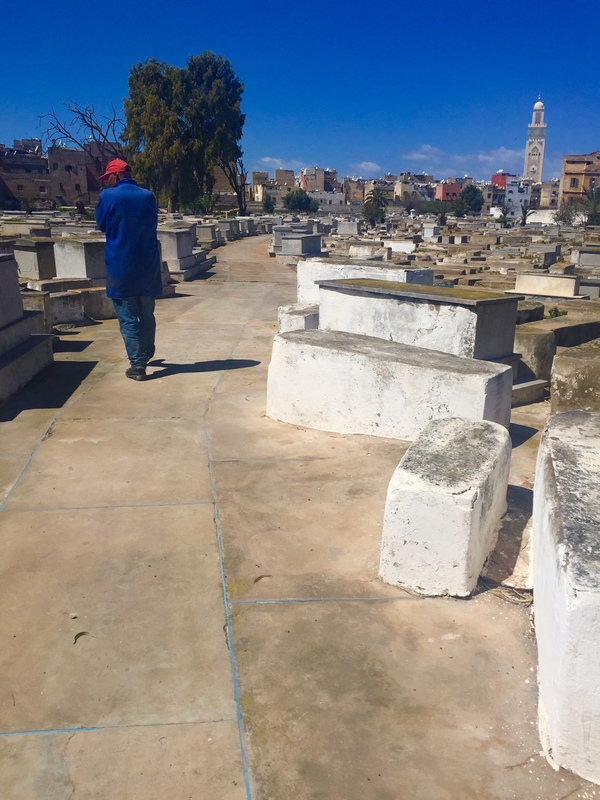 The Casablanca Jewish cemetery in the mellah (historic Jewish neighborhood, though no Jews live there now) is sprawling sort of circular area, hidden behind high walls and old buildings (it appears as a green space on a map). After a nearby storekeeper walked us to the entrance, we were welcomed by the caretaker. But, he told us not to take pictures (which we later think was because we only paid him after the tour or it was a total miscommunication since our common language was primarily hand gestures), so we wandered behind him while he pointed out graves to us and we discreetly snapped some photos. The cemetery was tidy, but an endless maze of above ground white grave sites interspersed with wild bushes and trees. 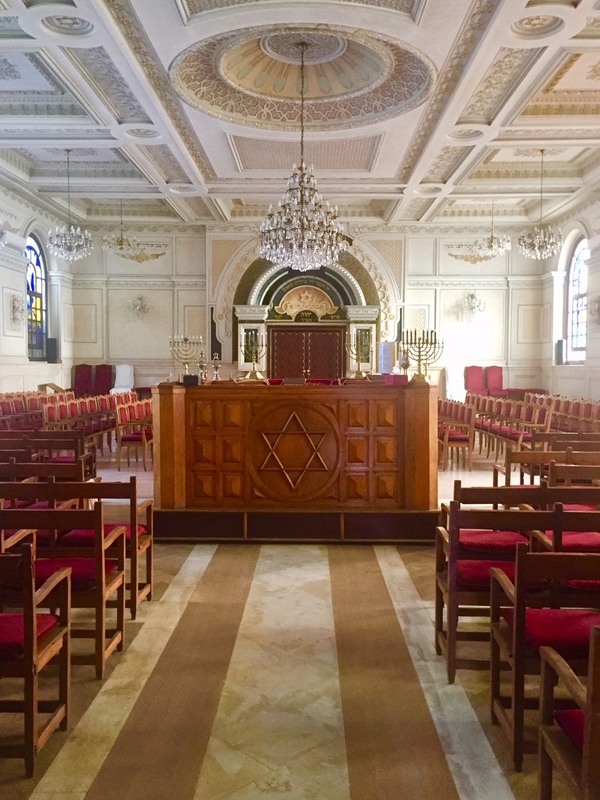 We also visited one of the main synagogues in Casablanca, a stunning building that was hidden behind a massive green metal door. Inside, it was lined with huge arched stain glass windows that allowed the sun to pour through in tinted colors. 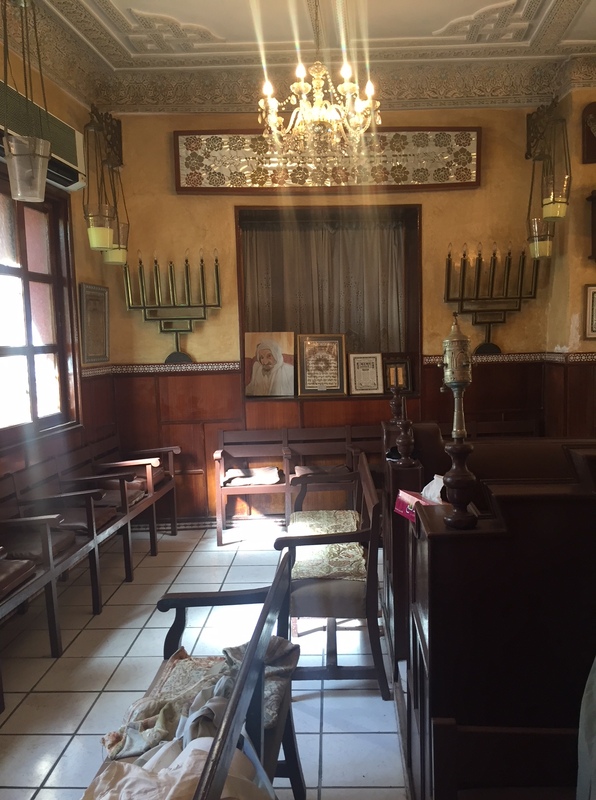 It was more formal, organized and less ornate than the Fes shul. Its exterior courtyard had a beautiful little garden and a sweet caretaker who sat in a booth by the metal door. The whole setting had a quiet, calming feel to it, despite the high rises and traffic just beyond its gate. Towards the end of the trip, we went to Rabat, a stunning, quiet, city about an hour away from Casablanca, along the coast. We stayed in the medina which, unlike the dark, crammed alleyways of Fes, was small, with wide and easily navigable paths. There is a tiny Jewish community in Rabat and still two active synagogues, including a historic one, next to the medina. Through the rabbis my friend had met on her flight from Israel, we were connected to Alain, who lived in Casablanca. Alain exuded Moroccan hospitality and was invaluable to our finding our way around the country in search of Jewish communities. We called him from Rabat and asked for help to find the synagogue. He gave us the number of a local woman to call; she then shared with us the contact information for the rabbi; he informed us that he was away but was still eager to help. He directed us to go to his house at the edge of the medina the next day to get the key from his housekeeper who would direct us to the synagogue. As always, we wandered around, this time at the edge of the medina, in search of the rabbi’s house. Once we had made it to the correct junction, there was a man sitting on a corner who answered our bewildered looks by simply telling us which house belonged to the rabbi. The housekeeper greeted us and took us down a block on a dusty road to an unmarked high brick-red colored wall with a large gate to unlock it. Behind it was a small garden and the entrance to the synagogue. Like the synagogue in Fes, it was in the process of being cleaned for Passover. And, it too, was filled with an array of mismatched hanging lamps, pictures covering the walls, and stacks of prayer books. The walls and benches were stained wood that helped to ground the bright, attractive but disorganized feel to the space. One side was lined with both small stained glass and large clear windows. 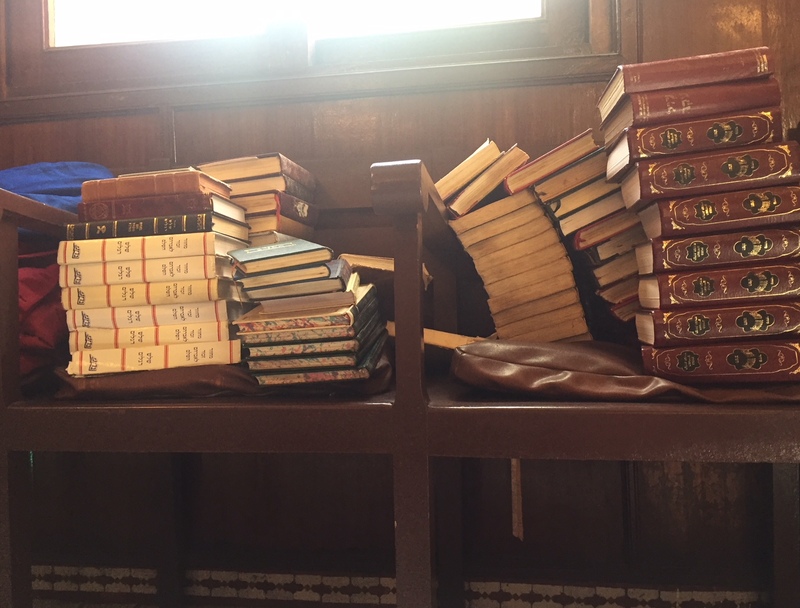 A small alcove room adjacent to the sanctuary was filled with pictures of Moroccan sages. 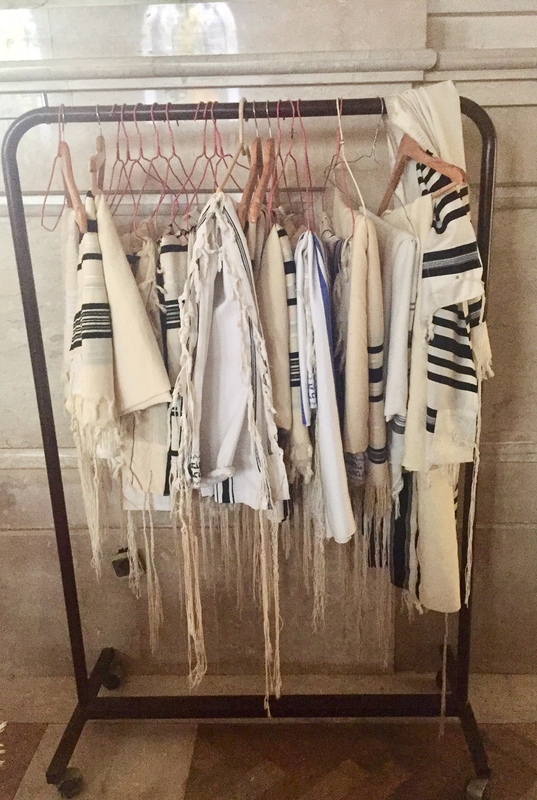 The synagogue had a grounding feeling that encouraged my friend and me to sit and reflect. When I was not tracking down Jewish sites, I spent time shopping for some of the beautiful artisan products of Morocco. My brother-in-law, raised primarily in southern France–and therefore a harissa expert–asked if it would be possible to bring some of this spicy condiment back. Harissa is ubiquitous to North African food. It’s hot without being overpowering and has a delicate taste and texture when well made. Of course, I answered from Rabat, that I couldn’t leave the country without packing my suitcase with Moroccan delicacies such as harissa, especially prepared for Passover, even though these were solely available in Casablanca. Fortunately, Alain’s brother happened to run the family’s kosher market in Casablanca. On my departure day, Alain generously picked me up at “the nearby train station” from Rabat and drove me for about 40 minutes through crazy Casablanca traffic to his family’s kosher store, JoJos. Upon arrival, I was warmly greeted by his brother and introduced to customers as they wandered in. 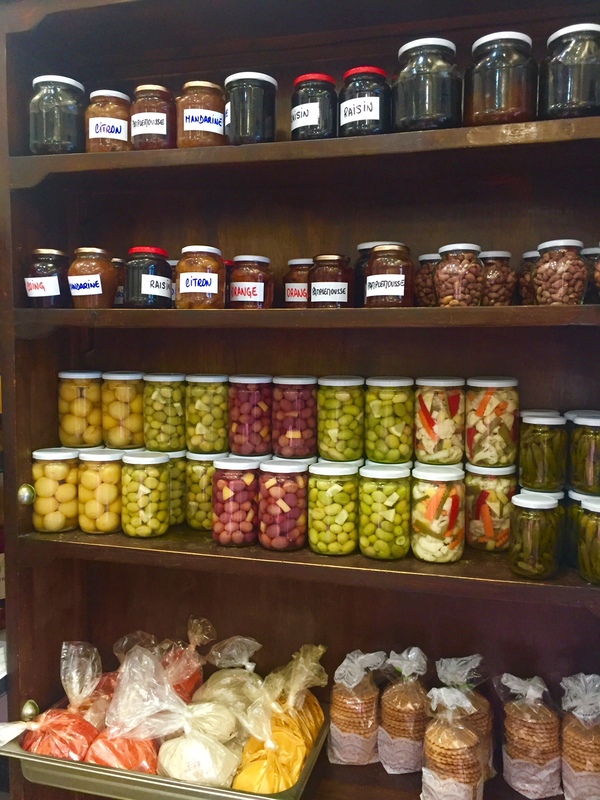 The length of the small store was dominated by a long case that was stuffed on one side with meats and the other side with desserts, with jars of harissa in the middle. One end of the store featured a heavy wooden case stocked with glass jars covered in handwritten labels for things such as olives, jams, preserved lemons, and wines. I bought all of their harissa, a jar of sweet eggplant jam and cookies. Alain wrapped everything as tightly as possible and presented them to me in little JoJo bags to stuff into my suitcase. 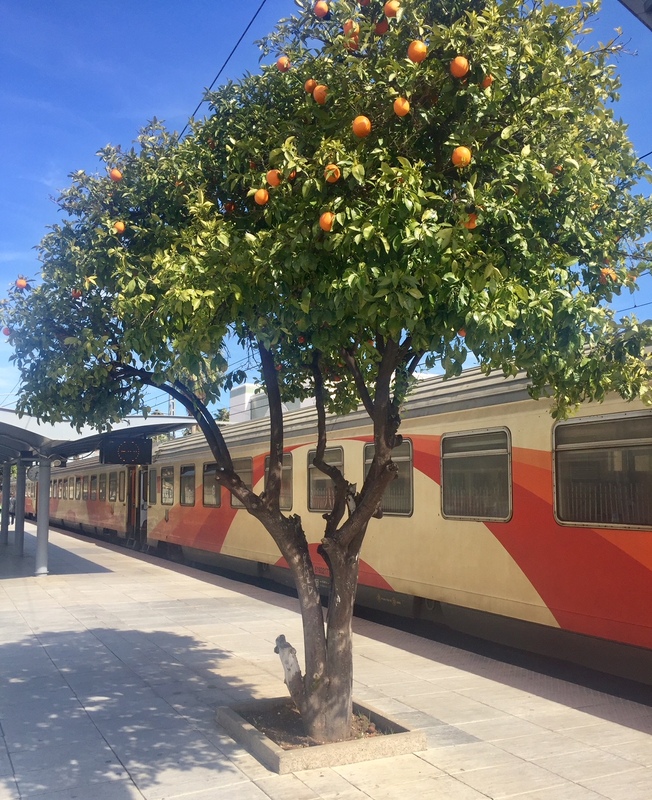 I saw orange trees growing everywhere, including train stations. The harissa was like none I had eaten before. We nearly finished and entire large jar of harissa during Passover. It was delicate and though it offered heat, it was balanced with a sweetness that created the perfect balance, with neither element overpowering the other. It was creamy and had the most beautiful dark red-orange color that was delicious on everything imaginable. With each taste, as the jar quickly dwindled, we lamented what to do when it would be gone (I had saved another one for myself that I refused to open during the holiday, knowing it would be finished, too). I have no idea how Alain’s family makes their beautiful harissa. 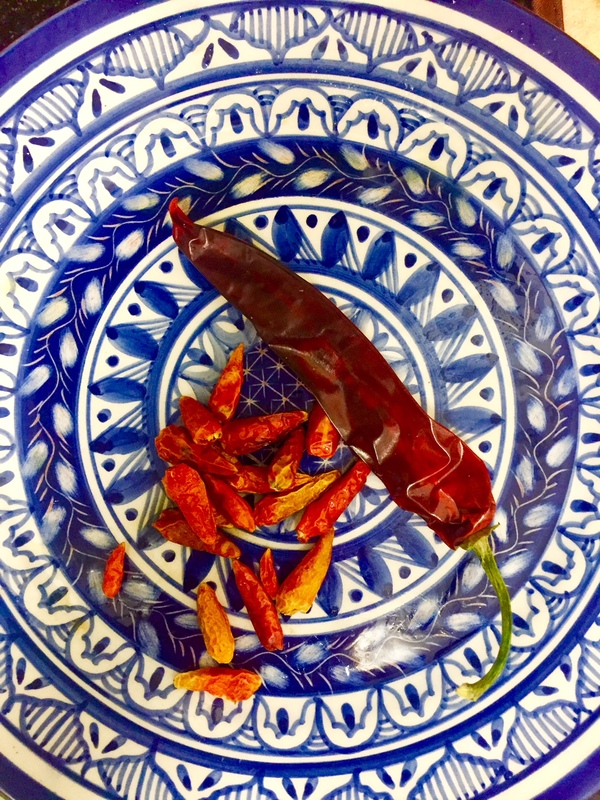 I do offer a recipe below and suggest that you use it in everything imaginable (many of my recipes call for schug and harissa can be used instead). Mix it into anything where you want a touch of spice and heat. Chili peppers. Plate is not Moroccan, but from the south coast of Portugal. 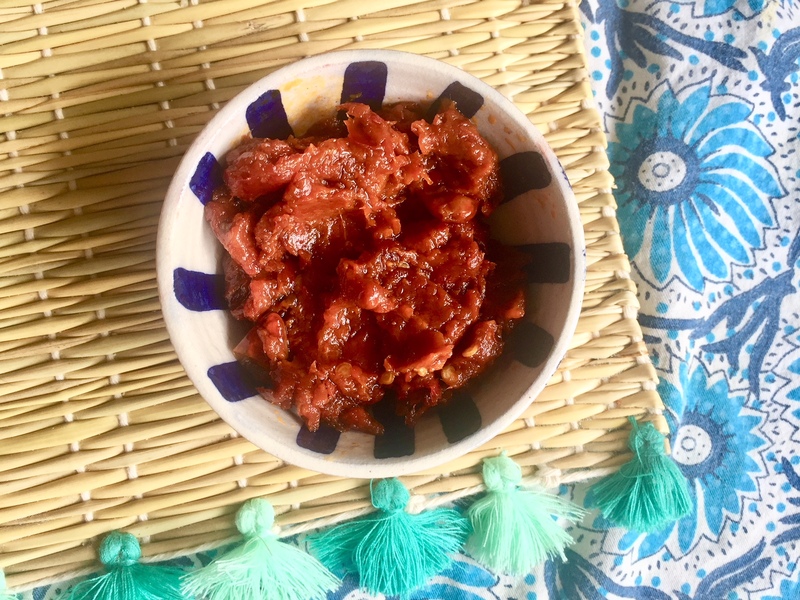 This harissa recipe is from My Moroccan Cooking. 1.Pre-heat the oven to 300 Fahrenheit. Line a baking sheet with parchment paper. 2. Drizzle the red peppers, chili peppers (if not dried) and garlic with olive oil. Place on tray and put in the oven. Let cook for about an hour, or until roasted. 3. Remove from oven and let cool. Once completely cooled, peel blackened skin and remove seeds from the red peppers. 4. Place ingredients in a blender and blend until smooth. 5. Place on low flame on the stove. Add a couple of tablespoons of olive oil and add the pepper mix and stir together. Cook over low heat until all of the liquid has evaporated. It should be a paste. This takes awhile (e.g. an hour). 6. Remove from the stove and put into a container. You can add more olive oil which helps to preserve it. 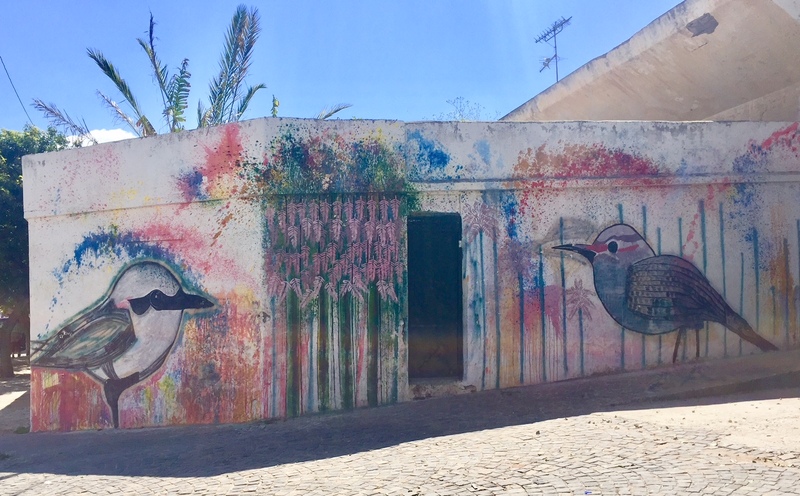 This entry was posted in condiment, Travel and tagged Casablanca, cooking, food, harissa, Jewish, Jews, kosher, Morocco, Rabat, Travel by Sarah Newman. Bookmark the permalink. Shout out to French class at Barnard! Loved exploring all these sights, tastes and smells with you! Thanks for bringing them all to life! Just got back from a trip (Stockholm, St. Petersburg and more) and loved it but didn’t get invited to anyone’s home. You amaze me. And the only recipe I came across is super- easy- caviar and crepes! Love the posts. Keep them coming. great-I hope you enjoy it! I agree-nearly everything is better with just a bit of harissa.